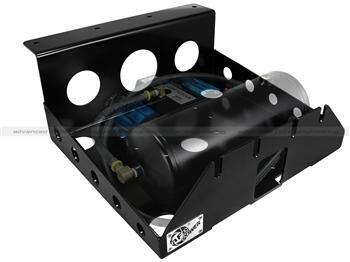 aFe Power is proud to introduce the all new Glide Guard On-Board Compressor Mount. This glide guard comes with a powder-coated matte black finish and counter-sunk mounting holes for protection. This is mounted onto the rear end undercarriage for tucking your air compressor and tanks as high as possible. This glide guard is constructed out of 3/16” thick steel to withstand extreme off-road conditions. This system bolts directly to factory locations for a hassle-free install. Air compressor and tanks not included.